Monte San Giorgio is a mountain at Lake Lugano known for its marine fossils from the Mid Triassic Period. At that time (about 240 million years ago), the area had a tropical climate and a sea full of coral, fish, (long-necked) reptiles and turtle-like creatures. 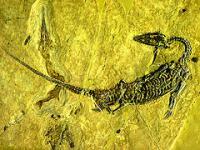 The fossils of these animals were found well preserved in what had been a sea basin. The site can be compared to Ischigualasto / Talampaya (same period, but not marine) and Dorset and East Devon Coast (partly same period, but not the same quality/quantity). Ideally, the site should be extended into Italy, as many important findings were discovered there. 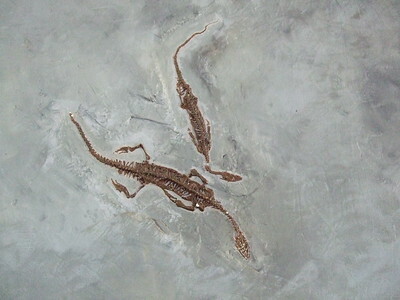 The fossils are displayed in museums in Zürich and Lugano, and in the local area (Meride, Besano, Induna Olona). As this is the first review of Monte San Giorgio at this website, and because it's not your run-of-the-mill tourist attraction either, I had to start from scratch in finding out how to 'visit' it. My conclusion after many hours of Googling is that there are two ways: by car 'from the back' or via a combination of boat and cable car 'from the front'. Visiting is a relative aspect here anyway - the IUCN reports of "boundaries (..that..) cannot be traced in the field". 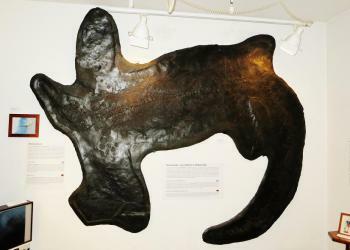 This site is all about fossils that have been taken away to museums a long time ago. We went by boat from Lugano: 3 or 4 of the excursion boats that tour the lake daily have a scheduled stop at the town of Brusino, at the foot of Monte San Giorgio. It's a pleasant 45 minute trip, on which the real geo-collector also can tick off the Italian enclave of Campione d'Italia. From Brusino there's a small cable car up the mountain to a panoramic terrace (close to the town of Serpiano). We enjoyed a good cappucino there, and then started walking. Several hikes are signposted from there. I had read about the 6 km long nature trail to Meride (which has a local fossil museum): interesting, but only doable for very experienced hikers. So we opted for the walk down to Meride via the main road. This turned out to be a good choice: it takes about 1h and 20 minutes, mostly through dense forest on a quiet and relatively flat road. The last part of the walk has lovely Alpine pastoral scenes (think cows with bells, stacked hay). And even industrial heritage: a small oilfactory that was instrumental in finding the fossils. The town of Meride where we eventually arrived looked totally closed down for a long siesta: no restaurant or shop open for lunch. The door to the inner courtyard of the museum fortunately was open. And what a funny little museum this is! It consists of one class room size exhibition room, totally self service. No entrance fee, no staff. The room holds old photos of the scientific expeditions that uncovered the fossils and of course a couple of small and large fossils too. There's a TV where you can start an educating video to learn about how and where the fossils of Monte San Giorgio were unearthened. According to the visitors guestbook there is about one visiting party a day. I even found that quite a lot, measured against the remote location and low profile publicity of this site. In all a worthwhile trip, very doable by public transport (we took the local bus back from Meride to Serpiano) and without any crowds. I had seen Monte San Giorgio from Lugano and also managed to visit Campione d'Italia in 2012. However I felt that this did not do justice to this WHS so in July 2013 while driving to Italy I visited the small town of Meride. The drive was a pleasant one (several hairpins and great views) and ample parking possibilities. Meride in July is similar to a ghost town, practically empty with the church bells echoing in the narrow streets. The quirky fossil museum of Monte San Giorgio others before me have reviewed has been upgraded and is now an informative 4 storey museum. There are original fossils and photos as well as models, reconstructions and a videoclip which really helped me grasp the OUV of this WHS. After Meride I crossed the border to Italy through Ceresio, Saltrio, Viggiù and Besano (where I visited another fossil museum). Researchers and universities in Italy and Switzerland collaborate with each other to meticulously study the different fossil layers that are unique in Monte San Giorgio because they offer the possibility of studying the evolution of different species of birds, insects, fauna and flora over time. My boyfriend (Lugano native) decided to take me here last week, as he has always wanted to see it and has never had the chance, and he knew that I would love it. We drove around Monte San Giorgio for a little while before he finally stopped and asked for directions from one of the locals. They sent us to Meride, where again, we were unsure where to go. He stopped another local and asked for directions again. We parked in the main parking lot of Meride just below the vineyards and walked around the town a little bit. It appeared deserted. We found the little museum mentioned in your article, with a little note on a closed door, and went inside. We watched the video and looked around. The fossils that were on display were very well preserved and AWESOME! They also had drawings of what the creatures looked like and what the environment that they were living in at that time probably looked like. A step back in time. After about 15 minutes in the museum, we wanted to see the site. We walked up the hill to the little church (which was beautiful), dipped our heads in the fountain (it was in the 90s) to cool off and started up the trail to see the fossil site at the top of the mountain. There's a sign that said it was about an hour and a half walk to the site. The trail was paved with little stones and very steep, surrounded by beautiful trees, steams and butterflies. After about 20 minutes of hiking up the trail with no water and flip flops (we hadn't planned on hiking obviously), we decided it would be smart of us to turn back. I will definitely be back, hopefully with my kids (6 and 7), some tennis shoes and a few bottles of water and make it to the top of the mountain. The town is empty, but cute and the hike through the mountains is absolutely gorgeous. But it is steep, no switchbacks, just straight up, so be prepared! 3.0: Stanislaw Warwas Antonio J.